There is a duality in the metaphor of the ocean. In Western iconography the ocean has been historically associated with nostalgia. Once imagined as a gateway to the New World, the ocean served a perfect screen to project the utopian dreams of the European imagination. However, once in the New World, these dreams were seldom realized, and the ocean soon came to symbolize deep feelings of loss and longing. In the Romanic paintings of Caspar David Friedrich women where frequently depicted in diaphanous clothing staring out to sea. This gesture represented not simply a nostalgia for home and a family left behind, but more specifically a deep sense of longing for the much anticipated return or loss of a lover or husband, without whom, she was incomplete. Contrarily, in Eastern philosophy, the ocean frequently symbolizes transformation and rebirth. In the words of poet Muhammad Rūmī the ocean is often imagined as a place where one is cleansed of this longing and attachment to earthly things. In his polemic text the al-Futûhât al-Makkîya (Meccan Revelations), twelfth century Islamic mystic Ibn Arabi describes the Self as being "an ocean without a shore". Here the ocean becomes a mystical place where one can truly experience "the Self" as a separate and whole entity. While land is consistently associated with belonging, ones attachment to it can be seen as a source of much human suffering. When land is removed there is no longer attachment and therefore longing dissipates. To be without longing is to become the ocean itself. 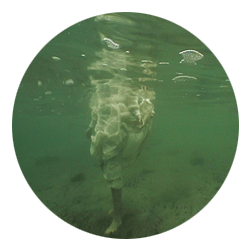 In her performance work Ocean Without a Shore, artist Tara Ernst imagines the ocean not as a symbol of loss and longing as but as a symbol of transformation. Removed from the nostalgic view as seen from a distant shore, she dons her diaphanous wedding dress (a reference to both Romantic iconography and her own personal past) and submerges directly into the Self. The act of entering the water serves as a transformative ritual, a symbol of rebirth and renewal; an act of detachment from earthy possession and a person history of loss. When she emerges, having shed the symbolic skin of her longing, she is alone, yet at last, whole and complete.